‘Giving,’ which is the first and fundamental law of life, is the first law of all creation. The attitude of getting is the law of life in a congested state or repressed action. As long as getting dominates the mind, that mind is in a paralysed condition being limited in its actions, in accord to the fundamental law of creation. An awful lot of people are stuck with that one concept. The majority of people are raised to be good little go getters, not good little go givers. We must, however, learn how to give before we can understand the law of receiving. Giving does not just mean money, it can be a whole host of things: time, effort, love, compassion, experience, advice. Giving should not be with the sole intention to gain as result. Give freely, learn to give generously and live life with sincerity and integrity and, then, watch what life returns to you -Givers gain. Look at the people in your life who give generously, who give freely and see what results they are attracting, are they living a rich live? and I don’t mean money. The laws are trying to teach us that we are spiritual beings having physical experience, giving feeds the soul and the spiritually within us, and if we give with a good heart then it is with certainty that you will receive. We receive so little because we give so little, they are poverty stricken because they refuse to give, whatever the natures of your possessions, give and give abundantly: give of your life, thought, interest, ability, energy, love, helpfulness and express your best when you do give. 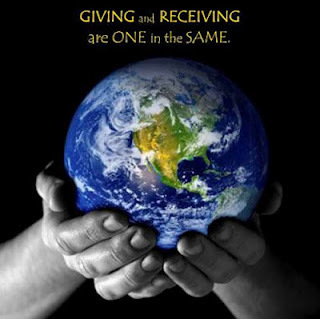 The more you give the more you receive – this is a science and cannot fail if adhered to fully – the law works. Proceed without doubt, without fear to desire and to expect all the the good you can realise, all the good you can enjoy, all the good you can use . when the mind of the person becomes unselfish to the point of yielding to the law then that person is born a new,for that persons attitude toward the law, himself and everyone else has changed and the affairs of that person take on the character of the newness of thought. The miracle is this – the more we share, the more we have. That which a man willingly shares, he keeps. That which he selfishly keeps, he loses. his horn [dignity] will be lifted high in honour. This article is extracted from the Law of Attraction Guides website. If you would like to study the Laws in depth, then check out their site and enrol in their course "The 11 Forgotten Laws" to become a Law of Attraction expert.